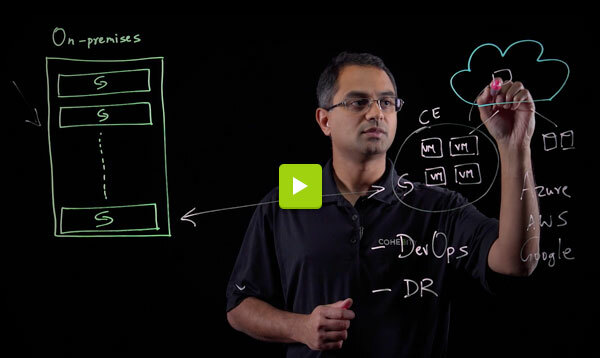 Welcome back to the Cohesity Tech Talk video series! In the past few weeks we’ve added a number of new topics to our Tech Talk series based upon customer requests. Before I briefly recap all of the segments we recorded for session 2, I’ll briefly discuss Ganesh’s file system lightboard. DataPlatform is a hyperconverged secondary storage system that at its core has a distributed file system. 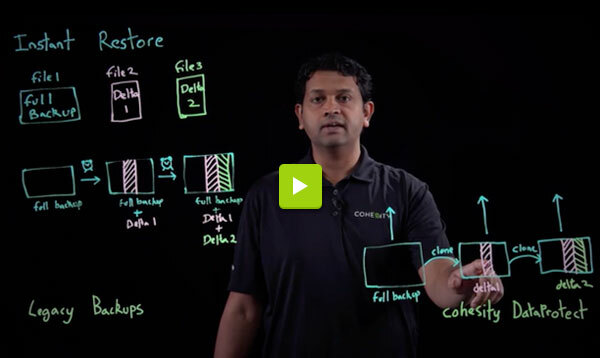 Being a full-fledged filesystem, Cohesity is easily able to build deeply integrated enhancements like backup adapters for integrated data protection of virtual and physical hosts as well as common data access protocols like distributed SMB and NFS. This blog aims to highlight some of the advantages a specialized filesystem can offer for backup and restores. The distributed file-system is specially designed for backups and can provide an effectively limitless number of writable clones using SnapTree(R) technology using a distributed B+ tree implementation. For virtual machine backups, specifically VMware, each VMDK is stored as a file. VMware’s VADP APIs provide a mechanism that allows efficient capture of just the changed blocks between VM snapshots. In order to take advantage of this technology, the very first backup is a full copy of the VM. Further backups are truly incrementals capturing only the changed blocks of each VMDK. 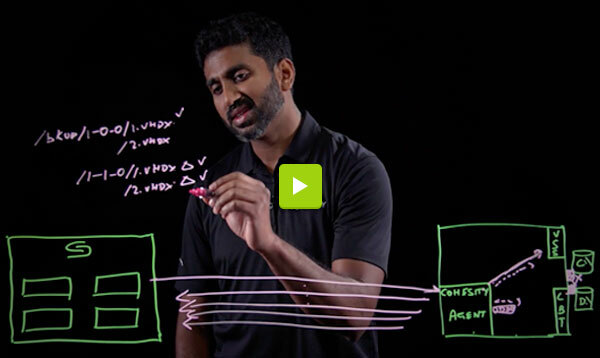 Here’s the cool part: each time Cohesity captures an incremental backup, we analyze the changed blocks and identify the changed data and the file offset where the change occurred. Once those changes are known, we instantly clone the full VMDK and write the changed blocks into the cloned file exactly where they are supposed to be applied. This is the key advantage of SnapTree’s ability to instantly provide writeable cloned snapshots that allow merging of new and changed data. Using this technology, all of the snapshots that Cohesity stores are kept fully-hydrated. Thus restoration of the VMs and their associated VMDKs is instantaneous without the need for consolidated changed data from various backup states. Also because it is extremely storage efficient, many snapshots can be maintained across minutes, hours, days, weeks, months, years and more. A number of customers have asked us to describe this functionality visually so here is Ganesha Shanmuganathan from Engineering describing it on the light board. 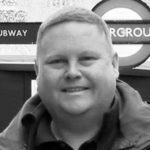 We’d like to hear your feedback for future installments on this segment of Cohesity’s file system! As promised, here’s a recap of the other videos in the series. 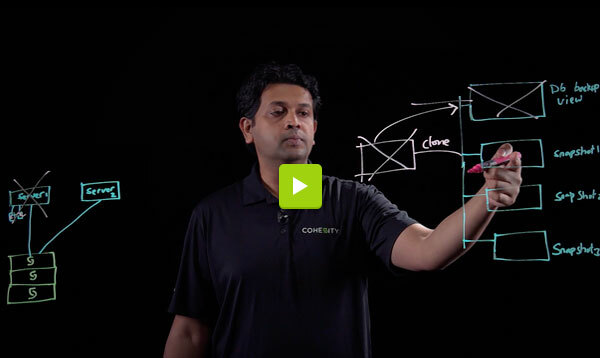 Finally, this video talks about Cohesity DataPlatform Cloud Edition (CE), the ability to run Cohesity in the cloud. This enables businesses to take advantage of the scalability, convenience and cost-effectiveness of the cloud for data protection, DevOps, and disaster recovery workloads. We hope you enjoy this second installment of the Tech Talk videos. Please keep your feedback coming and look for Session 3 soon!